This past weekend we had the opportunity to check out Holiday Valley Ski Resort's Sky High Mountain Coaster with Brit's family. This Wiegand produced alpine coaster did not fail to impress, as always, when it comes to their creations. The best aspect of this coaster is the fact that it is so hidden. This coaster traverses a pretty large mountain, through mature woods, and the layout twists right over a mountain creek for the entire ride. No need for snowblowers today! These rides are pretty awesome in the fact that they can operate year round. Riding one of these coasters in the snow is quite a rush. I was the first rider, so I got pictures of everyone else. It looks like Brit definitely had a blast. What do we have to say about the coaster? This thing is flat out awesome. So many little airtime hills, lots of tight curves, and the rush of careening through the woods is really something else. It is especially awesome with the autumn chill in the air. If you are around Ellicottville, NY, this is an awesome thing to check out. They also offer zip lining, a sky course, and a plethora of other activities, in addition to skiing and tubing in the winter. 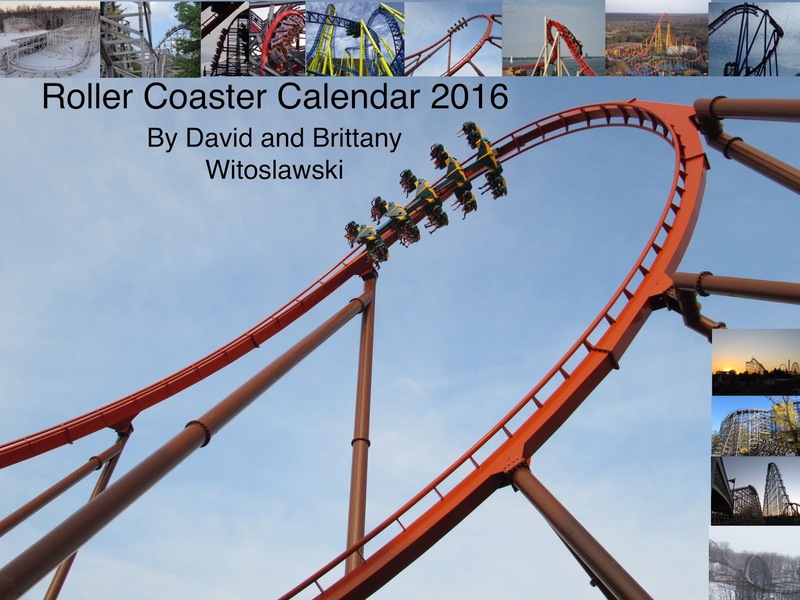 Our 2016 Roller Coaster Calendar is now available! For more information, follow this link! We were treated to a media preview of Phantom Fright Nights on Wednesday night to see some of the ghouls, and the brand new Friday the 13th 4D theater experience. We were entering the tunnel into the park and the ghouls were already spooking us! And by the way, the Phantom is up and running! Here is the new 4D Theater. The tame Ice Age: No Time for Nuts 4D experience for the regular season has been replaced with the pretty intense Friday the 13th 4D experience. It is described as "9 Minutes of Terror," and that is definitely a moniker that describes the feeling of being pursued by Jason. The 4D experience will change for the holiday season into The Polar Express. Until then, expect a violently intense experience with Jason and Friday the 13th. The Volcano Huss Enterprise ride is being completely replaced by the Enterprise that was taken out from Lake Compounce for the new Phobia coaster. The new 4D theater is pretty cool, with lots of sensory objects to immerse you into the experience. I can't tell you anything more about the Friday the 13th show, but now we will get a preview into some of the makeup work for the ghouls at Phantom Fright Nights. The park's very knowledgeable makeup director leads a team that often spends tons of time getting the ghouls ready for the event. The custom latex mask on the axe man is spectacular. If you like violently intense experiences for Halloween, 4D Friday the 13th is something that you will enjoy. Brit looks pretty happy for being in the midst of getting attacked by ghouls!